i will be performing as a guest member of juppala kääpiö, a project consisting of my good friends (and newly married!) hitoshi kojo and carole kojo (neé zweifel). we will be performing on the same bill as another married couple, who are also our good freinds, laura and antti from finland. a collaborative performance and workshop with paulo raposo of sirr-ecords from lisbon. for the workshop we will be getting out and experimenting with some site-specific sound actions; the performance will see us developing live work we started last month in lisbon at the radialx festival. one last workshop in the usa before returning to europe. contact me directly for attendance info. i will be guest-teaching in a few classes at simon’s rock college during the week, as well as perhaps giving an independant workshop, and a culminating performance. contact me directly for attendance information. i’ll be giving a presentation about field-recording, framework, and my work in general to robert rowe’s master’s students in music technology. contact me directly for attendance information. a workshop introducing concepts of deep environmental listening through an exploration of our immediate surroundings and a series of sound-hunting forays and subsequent listening sessions. participants will be asked to explore their everyday locations, to capture and present familiar or hidden sonic situations, with a focus on micro and macro-sonic activity. concepts of documentary and abstracted field-recording possibilities will be explored, as well as the parallels to photography inherent in this art form, duly dubbed phonography. work will start with a listening session of exotic and endemic field-recordings, and an exploration of the characteristics of non-musical sound. time permitting, some work will also be begun on compositional possibilities and artistic presentation. 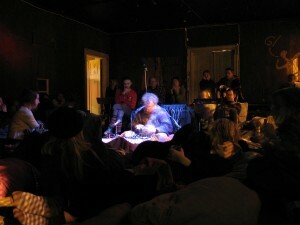 radialx is a radio-art festival which will consist of a series of lectures, discussions, workshops and performances. i will also be participating in the end-or-event sound performance. contact me directly for attendance information. a workshop focusing on sound as transmitter of nonverbal information, whether as a tool for communication or as a description of physical or imaginary space. we will focus on sound’s ability to define/describe space, and on our ability to resonate, alter, or create space by using sound. we will also explore animal communication and group activity. a strong focus will be placed on environmental listening, and the development of the ear toward detailed sonic perception. using small acoustic objects and the space itself, we will experiment with methods of group nonverbal sonic communication, with giving our location a voice, and with creating new spaces toward an understanding of sonic scenography. the workshop will open with an extended listening session, after which participants will work through a series of sonic games and be asked to bring objects to use in the later stages. thew workshop will culminate with a performance in the evening of the 7th. contact me directly for attendance information. i will be giving a workshop throughout the week entitled ‘miles per meal’ which will revolve around the concept of foodmiles, or the distance traveled by ingredients between their point of production and our plates. the practical outcome of each day’s session will be an evening meal for the workshop participants, and we will alternate between meals produced with only local ingredients and more unusual recipes from around the world. somewhere between cooking lessons and social politics. i will also participate in the final weekend’s sound event. a week of events /actions / workshops curated by the estonian arts center moks, also featuring visiting artists maksims shentelevs, kaspars kalnins, laura elcere, laura naukkarinen, antti tolvi, johanna lonka, jonna karanka and tero nauha. i will be giving a 2 day workshop in collaboration with maksims, kaspars and laura entitled sound as language / sound as space, and will be presenting work with the participants in a performance on saturday.